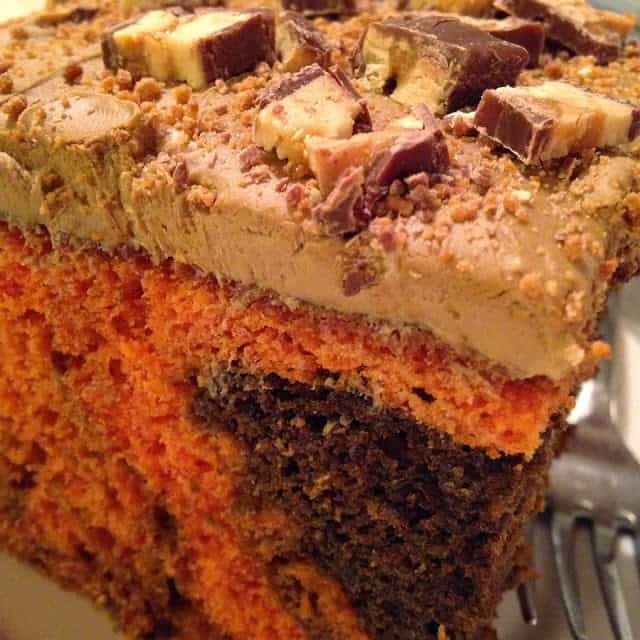 This delicious cake has it all. 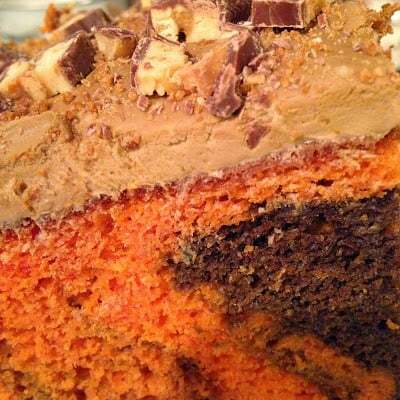 Great taste, fall colors, a yummy frosting and too top it off, chopped mini snickers candy bars. Can’t ask for more now can you. 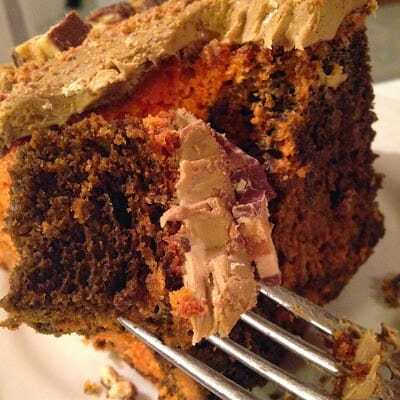 Autumn Swirl Cake with Maple Bacon Frosting was perfect for Thanksgiving Dinner. 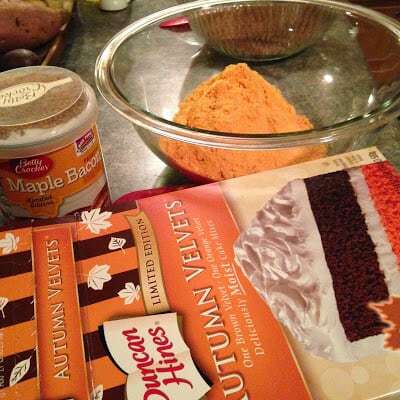 We always have pumpkin and cherry pie but this year when I saw that Duncan Hines had a New Autumn Velvets Cake Mix, I knew I was going to make this cake for Thanksgiving. Of course we also had the traditional pumpkin pie. After all, no Thanksgiving Dinner is complete without pumpkin pie! out at the same time called: Maple Bacon Frosting. I knew the minute I saw this frosting, I was going to give it a try! At first, I wasn’t sure what to expect with this frosting but this frosting is awesome! It has a wonderful maple flavor and the bacon flavored sprinkles were very subtle. Giving the finished cake a light smoky flavor. 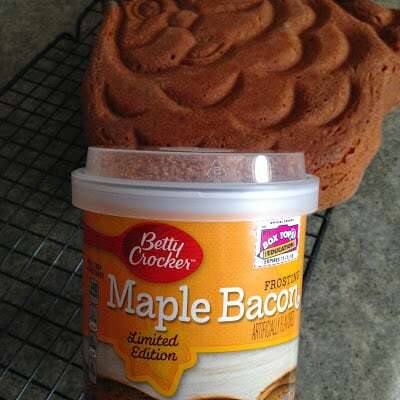 I decided to make Duncan Hines Autumn Velvet cake mix and frost the cake with Betty Crockers Maple Bacon Frosting. 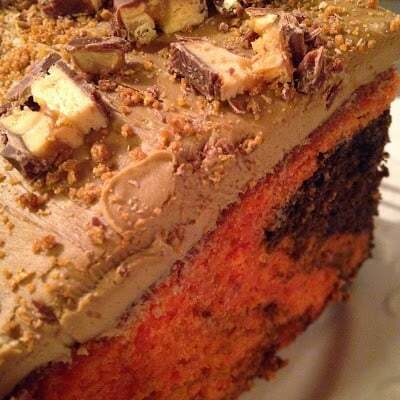 Topping the whole frosted cake with chopped Snickers Candy Bars was the cherry on top! 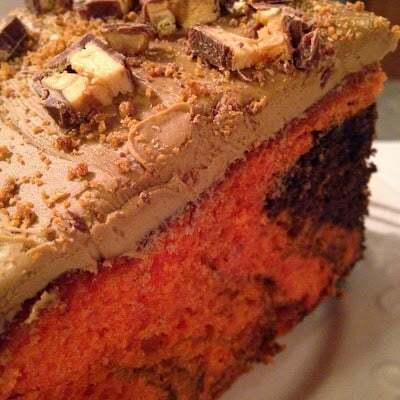 In large mixing bowl, combine orange cake mix with 2 eggs, 1/3 cup water and 4 tablespoons oil on low speed until combined. Beat on high for 2 to 3 minutes. Set aside. 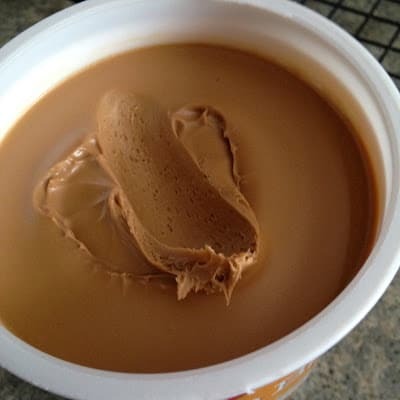 In large mixing bowl combine brown cake mix with 2 eggs, 1/3 cup water and 4 tablespoons oil on low speed until combined. Beat on high speed for 2 to 3 minutes. Set aside. Preheat oven to 325º Grease and flour cake pan(s). Pour orange batter at one end of cake pan, pour brown cake batter at the other end of cake pan. With a butter knife, cut and swirl through batters to create a marble swirl effect. Bake for 27 to 30 minutes or until toothpick inserted in the center comes out clean. Cool on wire rack for 5 to 10 minutes. Remove cake from pan(s) and cool completely. Frost with Maple Bacon Frosting. Garnish with chopped mini snickers candy bars. 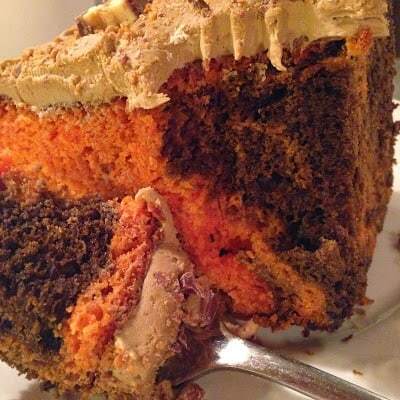 Such a fine cake, Lynn! You've created a winning combination with the autumn cake and maple bacon frosting. I've been wanting to try the velvet mixes for a while.